Donald Trump has been in office for two weeks. Let’s take a quick look at what he’s done. Trump has threatened to invade Mexico. From a Washington Post story, “‘You have a bunch of bad hombres down there,’ Trump told (Mexican President) Peña Nieto, according to the excerpt given to Associated Press. ‘You aren’t doing enough to stop them. I think your military is scared. Our military isn’t, so I just might send them down to take care of it.’” That would be an act of war against a neighboring country. Trump has insulted and alienated the Prime Minister of Australia, calling their conversation the worst phone call he had made all day. Are we really going to pick a fight with Australia, a country which has stood with us in every war since 1917? He’s willing to throw away a century of close cooperation in a thick-skinned snit? Trump has now compared his own American people to a murderer and former Soviet security officer for the KGB. In addition to crimes that didn’t make international news, Putin and his minions have shot down a civilian airliner over Ukraine, imprisoned, poisoned and murdered political opponents, rigged elections in his own country and possibly in ours. Trump has placed Putin on the same level as Angela Merkel, Chancellor of Germany, our strongest ally in Europe. Rumors continue to circulate that Putin and the KGB allegedly have a video of President Trump in the company of Russian prostitutes, partaking in sexual activities involving human urine. Additionally, the Kremlin claims that Trump has personal financial interests in Russia, perhaps including large debts he has incurred. The President’s obsession with promoting Putin and making excuses for his murderous activities, not to mention his refusal to release his tax returns, makes large swaths of Americans question his judgement and his true autonomy as a leader. Trump’s National Security Advisor Michael Flynn claims, “We are officially putting Iran on notice,” for launching a ballistic missile. No one knows what that means. Trump and his administration have said that could include military action. War with Mexico and Iran? Don’t expect support from Germany or Australia for those actions. Still, even above these dangerous relationships and heinous comments, the most concerning moves made by the Administration so far are the executive orders Trump is signing, 20 in his first 10 days of work. Executive orders (EOs), which Republicans called “lawless” when implemented by former President Barack Obama, are now acceptable, once again showing the hypocrisy of power – when your guy does it, it’s illegal, but when my guy does it, he’s a man of action and change. As of Super Bowl Sunday, Trump has signed 20 executive orders, which is more than John Adams, Thomas Jefferson, James Madison and James Monroe signed, combined. EOs have the weight of law, as they instruct government agencies on enforcing laws passed by Congress, but they cannot replace laws. That distinction is important, as the first order Trump signed was concerning the Affordable Care Act, colloquially known as Obamacare. Primarily for show, the EO states in ambiguous language that Obamacare should be loosely enforced, at least until the Republican-led Congress can formulate a replacement. Given that Obamacare’s policies (parental health insurance coverage until age 26; individuals cannot be denied insurance for pre-existing medical conditions) are wildly popular, and are tied at the DNA level to funding and implementation, Republicans have been unable to devise a replacement over the last six years. It is unlikely they will produce one soon, so the implication of this EO is unknown, but it’s a good bet any costs associated with looser enforcement will be picked up by American taxpayers and not insurance companies. Another EO loosens the environmental regulations sanctioned in response to increased business activities. This could mean fewer impact studies for companies and less enforcement of the regulations that still apply. This would result in greater profits for private corporations and increasingly polluted water, smoggier air and a less safe food supply for the rest of us. Building a wall across the border with Mexico was a major reason an older white demographic voted for Mr. Trump. Vilifying Hispanics was a central theme of his campaign, and the president signed an executive order to start construction. No funding source was identified for this $30 billion project, so expect the federal deficit to reverse course and become larger under Trump instead of smaller. The most controversial of Trump’s orders prevented individuals from seven countries (Iran, Iraq, Syria, Lybia, Somalia, Sudan and Yemen) from entering the U.S. This hasty and disastrous order applied to people who had already been vetted, including those who had legitimate U.S. visas or green cards. After causing chaos at airports across our country and around the world, Federal Judge James L. Robart put an end to the pandemonium caused by this reckless, slipshod executive order. Trump responded by insulting this judge, who was appointed by former President George W. Bush. This is not the first time Mr. Trump has belittled a federal judge, calling into question U.S. District Court Judge Gonzalo P. Curiel’s objectivity when plaintiffs were suing Trump over Trump University’s fraudulent practices. Trump claimed Judge Curiel’s Hispanic heritage made it impossible for him to be impartial in the case. Trump was later forced to make a large out-of-court settlement when it became apparent he was going to lose. 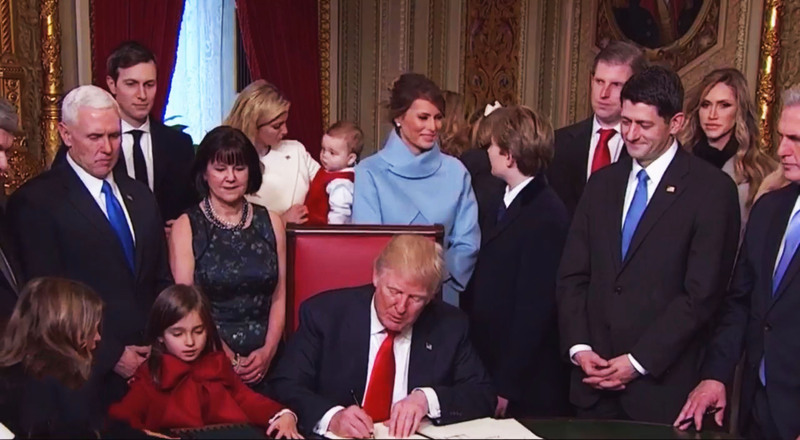 Trump also signed a toothless EO on lobbyists and a second EO which reduces government oversight of businesses, which will allow them to increase costs to consumers while making us less safe. While there is a legal distinction between executive orders and presidential memoranda (PM), PMs have almost the same effect as EOs, and Trump has signed several. Among the memoranda are a hiring freeze for the government, with notable exceptions for the Department of Defense, which constitutes over 30 percent of government personnel positions; a halt to new regulations until reviewed by the new administration; withdrawal from the Trans-Pacific trade agreement, which now allows China to become the economic leader of east Asia; three different PMs devoted to the construction of more oil pipelines, despite another pipeline spill of 176,000 gallons in North Dakota in December, which are being cleaned up by, you guessed it, the American taxpayers; Finally, he signed a PM to rebuild the U.S. military, as if it isn’t already the finest the world has ever seen. After 10 days of work, Trump, who vowed during his campaign that he would not take time off as president, left Washington for his home in Florida for Super Bowl weekend to meet with business executives and arrange deals, since working in the White House is only his day job.